According to Barrett, this rubber-leg monster will catch bass in any water, but it is perfect for fly fishing for bass here in Oregon. This beast is weed-resistant, heavy as hell, and indestructable. Tie up a bunch of these flies and go punish those non-native largemouth and smallmouth. Barrett says they taste great this time of year. 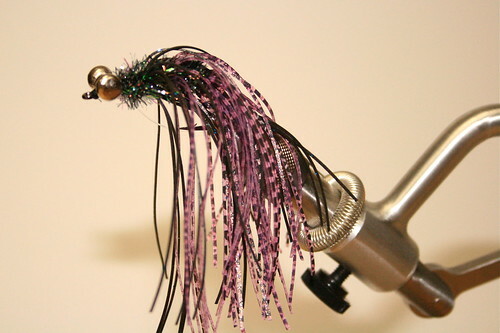 This bass fly pattern will work on Davis Lake or Umpqua Smallmouth. You bet . There are a bunch at the Caddis Fly right now!